As month earlier, good moon halos visited the skies also this time. The display in the night of 12-13. April was seen over large areas in Finland. Halo developement was best in Hyvinkää, where Jukka Ruoskanen documented the display. The photo here, taken by Ruoskanen, shows many features of interest. First there is Parry arc above the 22° tangent arc. Second, there are Lowitz arcs. 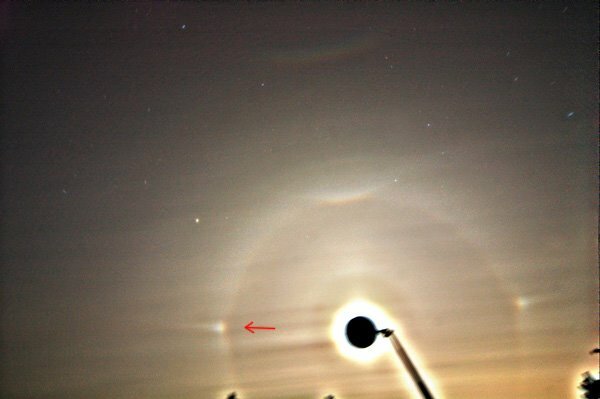 They are best revealed by the gap (shown with an arrow) in the 22° halo at parhelia level. Also, curving of 22° halo towards parhelia is evident. Third feature of interest is the 9° halo and the dark area inside it. Sometimes 9° halo is not seen in individual photos, but the conspicious darkening inside the halo location tells about it's existence. Stacking several photos then brings out the halo. The image here was stacked from 18 photos, but 9° halo was visible also in individual photos. Finallly, there seems to be also suggestion of 9° upper plate arc, seen as an enhancement on top of 9° halo. Nice, I had high sun display with smooth complete parhelic circle, circumscribed halo, and a faint circumhorizon arc. A fine display ! Traces of 18 and 35 degs ring seems to be there too ?! The activity in 18 and 35 areas is very unconvincing to me, and in my opinion those things should not be considered as halos. True halos are well defined arcs or patches, and the stuff located 18 and 35 degrees from the Moon do not meet these criteria. Whatever it is that can be seen in the photo is not halo-like enough. I agree I think that is from the enhancing process.